We’re rapidly coming up on Modern Masters 2015 release weekend. It doesn’t look like I’ll be able to do all the colors before the first booster draft/sealed event starts, but I’ll do my best. I’d like to let anybody know that’s playing in Japan this weekend or next week at GP Chiba that I have updated my Japanese-English Magic vocabulary page for older sets. Please be sure to check it out and study the key words before going to any event! Today I’ll be covering which black cards I think will be good in MM2015 Limited. At first glance, I would say that black is pretty strong. There are a lot of removal spells and some fairly aggressive creatures in the color. Black is definitely the backbone for a number of various archetypes in MM2: BW Spirit, BR Bloodthirst, BU Proliferate, and BG Sacrifice. I expect lots of the removal to be drafted heavily early on, and quite a few people to be using the color at a draft. Here’s my first choice for Black. 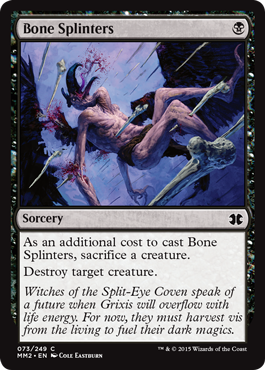 I’d thought I’d spotlight the great removal black has first, and nothing at uncommon/common is as good as Dismember. For as little as 1 mana (and 4 life) you can kill just about any creature in the set. It can also be played in any color deck, so if you’re playing UW Affinity or RW Voltron, you’d be perfectly fine playing this as 1 of your 23 cards in limited. I think this will be a high pick, if not a first pick most of the time. If you open it, put it straight in your hand unless you get some other kind of bomb card like Iona or Karn Liberated. I talked a little bit about how good I thought proliferate would be along side Bloodthirst and Graft abilities (as well as making more -1/-1 counters on opponent’s creatures), and slapping it on an uncommon for 5 mana seems to be just the right amount. I feel like this card was designed well in the Scars of Mirrodin block environment, and it fits well in this format too. I believe this card will be drafted rather highly as well. 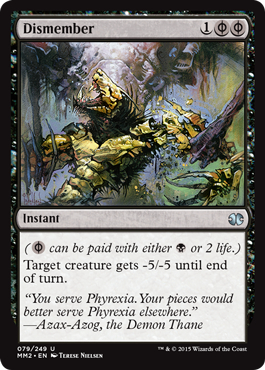 While not as good the other two removal spells I talked about, this card gets infinitely better if you have access to a lot of tokens such as 0/1 Eldrazi spawn or 1/1 Faeries from Bitterblossom. It’s only ONE mana and kills anything. It wouldn’t be my first pick if I was playing Bloodthirst or Proliferate, but if I was playing BW Spirits with Soulshift or BG sacrifice/tokens I would take it without a second thought. Not as high of a pick as Dismember and Spread the Sickness, but a solid choice nonetheless. Nameless Inversion is good because it can be used both offensively and defensively. Giving a creature -3 toughness kills quite a few cards in the set (I’d say 70% of the creatures), and if you have toughness to spare and are on the offensive, or want to trade with higher toughness creature, the +3 power can be useful too. You also can beat 2 mana at instant speed. When I said black had some good removal, I wasn’t kidding. You should have no problem taking out problem creatures if you’re playing black. I’d expect Nameless Inversion to be a solid removal card and to be a fairly early pick in draft. Moving on to creatures, my first choice is Scuttling Death. This card has value written all over it: Solid 4 power for 5 mana, a sacrifice ability so that its death won’t be in vain, and Soulshift so that whenever it dies you can grab another Spirit card from your graveyard (in this format’s case, I would probably be bringing back Thief of Hope, Ghost Council of Orzhova, Restless Apparition, Swans of Bryn Argoll, Moonlit Strider, or Waxmane Baku). I hadn’t really looked into the Soulshift/Sacrifice theme before in white, but now that I’ve looked into the synergy it seems pretty good. 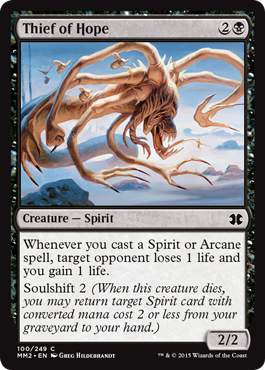 I’d be fine taking Scuttling Death as my 4th or 5th pick in a BW spirits deck, even if there were only a few soulshift targets. It just seems like a solid card. Thief of Hope’s Soulshift ability won’t be getting back anybody else other than Kami of Ancient Law, but if you’re building the deck for synergy I guess that would be okay. What makes the Thief a good card in limited is the incidently life gain/life drain effect. If you can draft 5-6 spirit creatures and cast them multiple times by using soulshift, you could easily change the tempo of the game into your favor. Death Denied is a card that would work well with this strategy (but doesn’t work as well with other ones). There are a decent number of spirit cards, and a few playable arcane spells, so I wouldn’t think it would be too hard to build a BW deck with a Soulshift/Drain theme to it. The more spirit/arcane spells you have, the better it becomes. I’d also like to say that I think Changeling/Shapeshifter cards should also count as Spirits as well when you play them. I don’t think it will be too hard to draft. Plagued Rusalka is a card that tries to bridge the gap between the Spirit world and the sacrifice world. It’s a good 1 drop in a spirit deck, but also works really well in a token deck full of 0/1 eldrazi tokens and reusable creatures such as Reassembling Skeleton. It’s not an incredibly important creature to get early in draft, but it should probably be in the 23 card deck you put together if you’re playing black as either your main or support color. You’ll always have a use for it, even if only to block and sacrifice it to kill another creature. 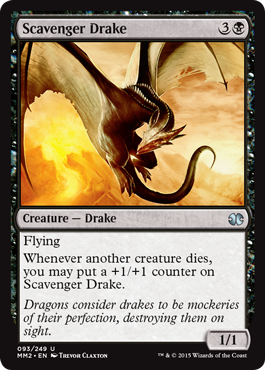 Speaking of all these Sacrifice effects, Scavenger Drake will become a bloated, flying mass of +1/1 counters in this format. Between sacrificing, kill spells, and -1/-1 effects, I think you should have no problem making the drake a formidable flyer in a few turns. I’m not sure I would take this as a first pick, but if you already have the start of a good black deck and some removal in your hand, definitely pick him up. If it was the second or third pack and I was heavily into black, it would definitely be a first pick then. The drake could easily become your finisher over 2-3 turns, or even faster if you have some proliferate effects in your deck. Ghostly Changeling is another creature I like. It counts as a spirit in a BW spirit deck, but can fit in any black deck. You definitely want to have him in a 2 color deck so you can take full advantage of his pump ability. If left unchecked it can quickly take over a game. I see it as a good roleplayer, doing a good job on both offense and defense, and it also fits well on your mana curve. It won’t be a high pick, but if it comes back around to you in draft you can be sure black is relatively open. 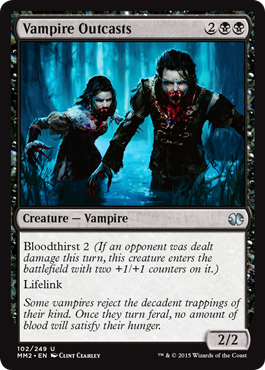 Vampire Outcasts will shine in a BR Bloodthirst deck playing burn, creatures with evasion, or pingers like Goblin Fireslinger. I think it would also do well in UB proliferate alongside a handful of flyers to make it easier to push damage through. It will also be alright alongside Graft cards in a BUG deck too I think. The only drawback of the card is having a consistent damage dealing plan. If you can’t sneak damage through in the air or by burning them, it will be hard to play them as a 4/4 with Lifelink. It could carry a lot of synergy in some decks, but be downright awful in others (value wise). Duskhunter Bat runs into the same problem as the Vampires, but at least with flying you can be sure it will allow other Bloodthirsty creatures to activate their abilities. I would strongly consider playing it in that regard in a Bloodthirst deck. I believe it would work best in a Grixis (BRU) Proliferate/Bloodthirst and a BUG Graft/Proliferate deck, just because you can maximize the use of those counters in many more ways. Definitely not a high pick in draft, but a good card to finish out your deck with. My last pick for black is Dread Drone. It’s a glass cannon with high power and low toughness, but it also puts in 2 token creatures. If you’re ramping into a bigger creature such as Midnight Banshee or a planeswalker like Karn Liberated, it’s always good to have Eldrazi spawn around. Getting 3 bodies for 5 mana seems worth it in my opinion, and his 4 power will trade with a lot of creatures in the set. Even if you’re not ramping up to a more expensive card, I think it’s still worth having him in your deck. You never know when 2 mana will come in handy, and 4 power can be a lot of pressure on an empty board. 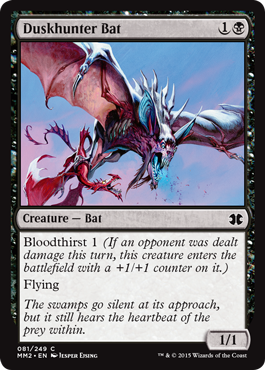 Bloodthrone Vampire – if you have the tokens or recurring creatures to take advantage of it, Bloodthrone Vampire can be insane. It really depends on your card pool. I expect it to see play in a GBW Spirits/Token deck. Daggerclaw Imp – If you’re playing a UB or BW deck with a lot of flyers this will be a solid card. It’s only problem is that it dies to just about everything with one toughness. Death Denied – another card that seems decent depending on the pool. I said it would be great in a BW Soulshift deck with Thief of Hope, but I don’t think it would be bad as a late game card with a board full of mana to get back all of your creatures. Good card to take that 23rd spot in your deck. Devouring Greed – good in BW spirits and not much else. Deathmark – great removal against GW creatures from your sideboard. Grim Affliction – another decent removal card. People see only one -1/-1 counter, but it’s actually -2/-2 if you want it to be, plus you can proliferate to kill other/pump your creatures. Can be really good in certain pools. Instill Infection – can be good in a proliferate themed deck, but I think there are much better removal cards to be played instead. Reassembling Skeleton – he just keeps getting back up! Solid 2 drop I think but not a high pick. Sign in Blood – if you’re not playing blue, it’s the next best thing. Good in BR Bloodthirst and BW spirits to get some card advantage. Vampire Lacerator – if you can deal with the loss of life, go for it. Modern Masters 2 is definitely shaping up to be an interesting limited format, but I still can’t believe all of the non-modern cards showing up in the set. There are barely any EDH cards, nothing casual players would really like, and any card a Modern player would want is concentrated mainly at the mythic rare level. It’s quite a let down value wise, but for people who enjoy drafting/sealed it should be good. How’d I do with black you think? Do you agree/disagree or think there are better combinations that I didn’t cover? If so, please feel free to leave your comments below. At this point of my review, I would say that the UB proliferate/Bloodthirst archetype is looking really good, and BW Spirits/Tokens is a close second. There is still so much left to do, so I can’t relax just yet. I’ll be trying to work on Red next and hopefully it will be out on Friday before FNM begins for those of you doing a MM2 booster draft. I hope to see you back then and I hope my tips help you out at the next Modern Masters 2015 limited event you do!